Researchers from the University of Nottingham discovered a new method to control the structure of magnetic domain walls. Controlling and reading the chirality of the domain wall can be eventually used to create information and logic devices. In a magnetic wire, magnetic domain walls are areas that separate regions where the magnetisation points in opposite directions. Under certain conditions it consists of a region in which the magnetisation rotates around a central vortex core, which points into or out of the wire. The rotation 'direction' (clockwise or anticlockwise) of the vortex wall is called the chirality. The chirality can be controlled using magnetic fields, but these solutions are highly inefficient. The researchers now managed to do the same using an electric field. This was a surprise discovery - the researchers actually set out to find a way to move the domain walls, but found out that the chirality changed when the electric field was applied. 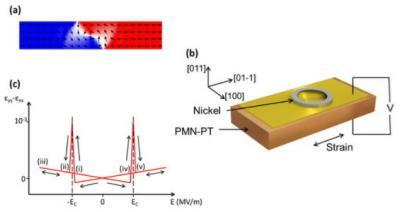 A research group has determined how to control the magnetization of a "magnetic vortex"